Full VorpX Review - Worth To Download in 2019? Considering to buy and download vorpX for yourself? It’s 2019 and I’ve used this program for 6 years now and can give you all the pros and cons of personal experience. I’ve come to notice that there aren’t many reviews of this program, so I decided to do an article on vorpX. Keep in mind, it is mostly for those who are new to a VR scene and are not familiar with all the third-party programs. VorpX is a 3D injection program made specifically for Oculus Rift and HTC Vive. Recent updates added support for all VR masks that can use SteamVR. With VorpX you are able to play DirectX 9-11 games that do not natively support virtual reality devices like Oculus Rift or HTC Vive. If not for vorpX, you couldn’t play GTA 5, Batman: Arkham Knight, Far Cry Series, Fallout 4, Bioshock: Infinite or 250 other triple-A games with your head mounted display. The games you can play can be seen below. Scroll down for the full list. – Prey : Geometry 3D added, DirectVR FOV/resolution working again. – Resident Evil 7: hand shimmer/glow fixed. – Need for Speed Rivals: street reflections fixed. – Battlefield 4: Geometry 3D and scalable HUD added. – Star Wars Battlefront 2: Geometry 3D added. – Mass Effect Andromeda: Geometry 3D and scalable HUD added. – Deus Ex: Mankind Divided: Geometry 3D and scalable HUD added. – Elex: Geometry 3D and scalable HUD added. – Max Payne 3: DX11 G3D flickering elements fixes, DirectVR tweaks added. – Arma 2: the game could crash on device reset (e.g. resolution change). – The Witcher 2: Geometry 3D did not work anymore. – GTA V: scalable HUD added. – What Remains of Edith Finch: various fixes. – The Darkness II: G3D did not work correctly anymore. The update that brought these game above, also dealt with a lot of performance issues, as well as bug. 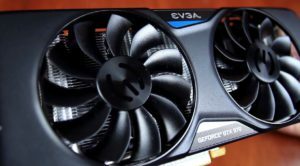 Optimization is an important part since the games themselves release updates regularly, and it’s Vorpx’s job to keep it. Fortunately, they haven’t been slacking here. Frostbite and CryEngine support have been tweaked for more optimization. Ralf – the maker of vorpX – started to work on his program in 2012/2013, around the same time that DK1 was released to the public. He spent several hundreds of hours on testing various VR related things so that he could identify and resolve issues that arise with playing older games on VR masks. Now that many years have passed, his craft has improved even more. How it works is, it basically injects itself into game files and divides the game screen for each virtual reality lens. There is no other VR program that can inject itself into so many games as vorpX can. Once it is running, just turn on your Rift or Vive and launch a game that is on the list. The 3D effect you get will be much more immersive compared to regular 3D monitors that cost thousands of dollars. Why you might ask? Regular 3D monitor separates focus and convergence. It’s because they simply cannot give the same effects as human eyes can. With VR however, separate screen creates an additional 3D effect that is similar to the everyday world. 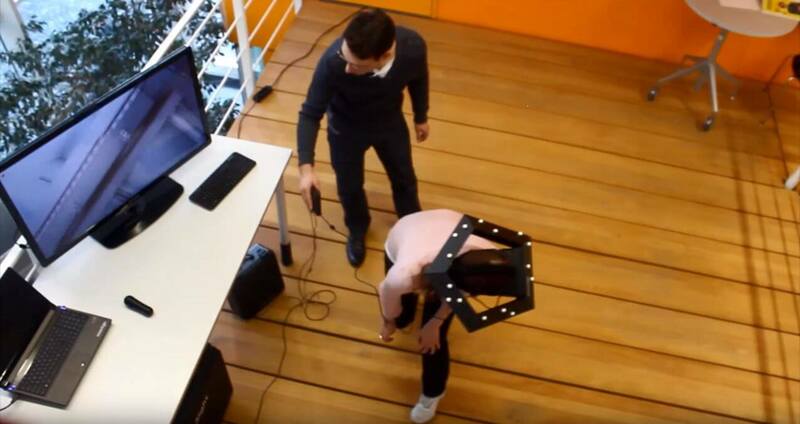 This is why everyone is absolutely baffled when trying out VR for the first time. VorpX helps us to do that with a feature called Adaptive 3D-Algorithm that simulates the way our eyes focus. It’s only one of the features that vorpX has. The sense of scale is also something that I am impressed by a lot. With vorpX you can see the world of your favorite games as if you were actually in it. The right picture is more or less what you’ll experience in vorpX supported games. Ralf, the creator of vorpX, loves VR. It can be seen through his constant and regular updates. I know many programs that promise one thing but when the time comes, they disappeared from our eyes. It is already 2019 and he still releases updates with new features, games, bug fixes, and overall more support. VorpX is a fairly popular program. The developer Ralf, could have left it at that and just cashed in on that. Instead, he pushes through and constantly listens to his community on what he should change or add. Because of that, we can now play with Oculus Touch and HTC Vive controllers. Another thing the community was complaining about (and that he later fixed) was the fact that they needed to manually change some of the settings to make it playable in VR. Although it may not have been a problem for some, the others may have wanted for everything to work correctly from the get-go, because sometimes we don’t want to waste time searching for articles on how to set everything up. I know the pain because I’ve written countless posts on vorpX settings and it’s annoying to search for information that is so scattered all over the internet. That is how DirectVR was born. DirectVR automatically changes resolution, FOV, and various game settings to make sure that you get the best VR experience. Simplicity is always a welcome sight, and seeing it in VorpX reassures me that it’s truly a useful and regularly updated program that everyone should get. 1) Head-tracking is basically what sells virtual reality. If not for this feature, Oculus Rift, Vie and PSVR could have been another one of those failed projects that had potential but did not deliver. VorpX, luckily, had head-tracking support from day 1. 2) Positional tracking means you can move your body in one direction and the in-game character moves accordingly, just like in real life. This feature was added to Oculus Rift only when DK2 came out in 2014. As soon as it happened, Ralf worked on vorpX to support this feature also. 3) 3D support, as we mentioned, is available, so you don’t have to worry about regular 2D games looking like crap on your Rift. This actually brings us to another point. 6) VR video player mode feature, for example, has been added only a few months ago, and it works flawlessly. 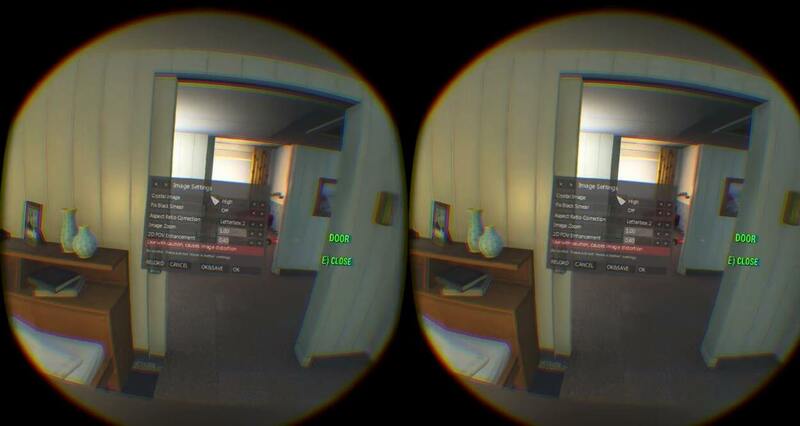 If you don’t know, VR video player mode lets you watch 3D movies on your Oculus Rift. The 3D effect is even better, as long as you have a suitable VR movie. Plus, you can make your screen as big as you want, even to the size of a real theatre. Really nice feature. 7) The user interface, aka UI, always plays a big role in user experience. The more simple it is, the better. When opening a vorpX menu in-game, it gives you a cursor. Everything on the menu is easy to navigate and is understandable. 8) Customization in vorpX is huge, literally. If you do not like some features, you can manually disable it in the menu. If you think your FOV is too zoomed in, everything can be regulated. That lets you configure settings to your own preference, like for example if you are motion sickness intolerant. 9) But the biggest plus in my book is its customer support. Not a lot of third-party programs have their own forums, especially considering the fact it’s a one-man show. Ralf is answering to almost every question, and even if you don’t get an answer, other users will definitely reply. 1) 3D Geometry is not in every game. Geometry 3D mode is basically a mode that gives you the best 3D effect. Without it, vorpX supported games run on Z-buffer 3D. That means the 3D effect will not be as amazing on close range things (you look at the table close to you, and it seems to be flat). 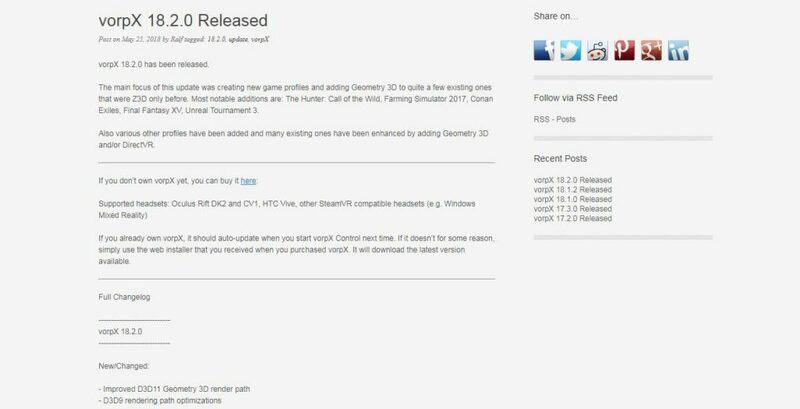 Apparently, the reason some games don’t support Geometry 3D is that it requires too much from your computer, and if the game is not properly optimized, you will have 30fps with “Geometry 3D enabled”. We all know that 30fps is garbage for VR. At the end of the day, 3D will still be there, but not as amazing. That is being fixed with each update, but it’s still an issue. 2) Some games just don’t work properly with vorpX. Every once in a while (1 out of 20) you encounter a bug that just ruins your experience. Either you get a black screen or head tracking doesn’t seem to be working. Look at this Call of Duty article for reference. Issues can be fixed if you contact Ralf, but it just takes a lot of time and effort. 3) Manual tweaking is sometimes necessary. Not as big of an issue, but it does eat up your time. 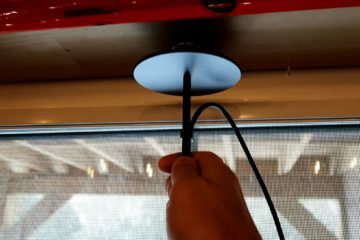 That is why I have so many helpful guides up on how to set up your desired game for Oculus Rift. 1) A good computer is needed. The reason I put it in the middle ground is that it’s not really a vorpX issue. All Oculus Rift VR games require you to have a powerful VR PC, and if you don’t meet the requirements, FPS will eat your soul (referring to motion sickness). But if you already have a mighty PC next to you, using vorpX will not be a problem for you. 2) Price. At the moment it costs €29/ $39. Not expensive at all, considering how much value vorpX brings to the table. Plus, it is forever. Pay once, and you are good forever with infinite updates. But still, it costs. You could argue why should I pay extra to get access to more features, which is fair. But it is made by a person who is dedicating a lot of time to give us this option, and he is not sponsored by Oculus. Paying him this sum of money is least we can do for all the hard work he has put in. Should you get it? If you have Oculus Rift or HTC Vive, it’s a no-brainer. Really, it truly is an only program good enough to give us so many VR game options. If you want to see the full list of vorpX supported games, click on this link and scroll down. As I’ve heard, the creator of vorpX is already working on many new features that we should be getting in the coming months, so once you have vorpX, you are done – constant big updates all year around. With its high customer support, you should never be in danger of being alone buried in your VR problems. Forums are right near you and are eager to help. A year ago I would say vorpX wasn’t as good, but over time it has exceeded everyone’s expectations. I am sure as time goes on, it will improve even more. It’s not a coincidence everyone is saying that support for 1 game like Skyrim or GTA 5 alone is worth the price. If you have anything to add about vorpX or have any questions, feel free to leave a comment. Maybe match the price in Canada ($39.99) to the US and enforce a Canadian billing address to purchase? Yeah, the price difference in different regions is unfortunate. Most electronic things that are cheap in US cost almost twice as much in Europe. At the moment, you do have to have either Rift or Vive. However, Ralf is probably already working on a solution for Oculus Go, just like he was working on HTC Vive as soon as it came out. Once Oculus Go support comes, I’ll make sure to let you all know and update this article! Are they still updating it? I’ve seen vorpx a few years ago but didn’t have enough money to buy it then. As long as they release new games that I can try in VR, I am fine with it. Yes, they are, and constantly. It looks awesome! I’ve seen the dev for this program be very active on forums and stuff. He really helps out his peeps. I have vorpx its pretty good. The only issue is that i wish more games were supported for vr. VR just makes everything so much more interesting to play. Yeah, luckily he keeps updating the game support list so it’s a matter of waiting it out. Ralf might even do a request injection. You’ll have to message him. Oh man i LOVE this program. You should try out Skyrim with that. Jesus christ its like a whole nother world opened for you and after playing it on pc for many years, going into it with VR is undescribable. It takes a lot of time. You have to manually create scripts for each game that comes out. That would be tempting indeed. Does vorpx support all games that are coming out? Not all, but Ralph the owner is trying to add support to as many popular games as possible. Yeah vorpx is super awesome. Some games I wanted to play in VR are only possible because of vorpx. Same, gotta give credit where credit’s due. I’d probably be more inclined to buy this if I was given a demo that I could use to see 1 game modded to VR for myself, people can write all the reviews they want but in the end the proof is in the punch. Yeah, as far I know, there are no demos. But be assured that it will work just fine. I just played fallout 4 in VR, and let me tell you it’s the real deal. You are in the game. I actually was turned off by the floaty hands used in the official Fallout 4 VR, and Vorpx is a perfect fit for me. You use controls like normal, and I don’t have to buy Fallout again. Yeah, same games are even better played in vorpX for some reason. Thanks for letting me know! I will look into it.